In spite of research showing that school funding leads to better outcomes for students during their school years and afterward, a new report finds dramatic unevenness among education funding across states. New York and Alaska, for example, spend more than 2.5 times what Arizona and Idaho spend. There's been no improvement since the end of the "great recession" in those states that don't provide additional funding to districts with high student poverty. The details are shared in the seventh annual edition of the Is School Funding Fair? A National Report Card, a joint project of the Education Law Center and Rutgers University's Graduate School of Education. Be "sufficient overall" as the starting point for any funding formula. The project used data from the 2015 Census fiscal survey, the most recent one available. Besides examining "raw" per-pupil spending, the researchers also looked at factors such as whether states provide a sufficient level of school funding and how that funding is distributed according to student needs determined by poverty level. It also took into account each state's spending "effort" relative to its "fiscal capacity," measured by gross state product and personal income. The study found that disparity among states is broad. Funding levels ranged from a high of $18,719 per pupil in New York in 2015 to a low of $6,277 in Idaho, just a third as much. In both of those states, however, the ratio of funding in high-poverty districts compared to low-poverty districts was fairly similar — 99 percent for New York and 96 percent for Idaho. Most states use "flat" or "regressive" funding approaches that ignore the needs of high-poverty districts. In 2015, just 11 states used progressive funding systems; twice as many did so in 2008. States' fiscal effort also varied widely. According to the report, the lowest-effort states spent about $25 per every $1,000 in economic productivity, compared to $50 for high-effort states. When examining personal income, the low-effort states budgeted $29 per every $1,000 in aggregate income, vs. $64 in the high-effort states. The report also examined the degree to which wealthier families opted out of public education in lieu of alternatives, which, the researchers noted, could affect the "public and political will necessary to improve school funding." The percentage of school-aged children attending public schools varied from a low of 78 percent in Hawaii to a high of 93 percent in Utah. Two states — New Jersey and Wyoming — are the only ones "positioned relatively well on all four fairness indicators," the report stated. Four states received a C grade in funding distribution for all four fairness measures. California, Florida, Louisiana and Tennessee rank in the lower half of states on funding level, have below-average effort levels and flat or regressive distribution of funds. The researchers noted that states with low or flat school funding show poor results on indicators tied to student success: Access to early childhood education is limited; wages for teachers don't compete with those for comparable professions; and teacher-to-pupil ratios in schools are "unreasonably low." "The [National Report Card] is a sobering reminder of why unfair school funding is the most significant obstacle to improving outcomes for our nation's public school students," said David Sciarra, the Law Center's executive director and a co-author on the report, in a prepared statement. "The stark reality is most states still fund their public schools based on pure politics, not on the cost of delivering quality education to all students." "School finance reform is long overdue," added Bruce Baker, a Rutgers professor who developed the report's methodology. "It's long past time for states to develop, and then fund, finance formulas built on the costs of providing essential education resources, accounting for diverse student needs and local fiscal capacity." "This edition of the National Report Card, like its precursors, demonstrates that school funding remains stubbornly unfair in most states," concluded the report. "As a result, states have failed to create finance systems that support improved student outcomes, especially among the nation's low-income students." 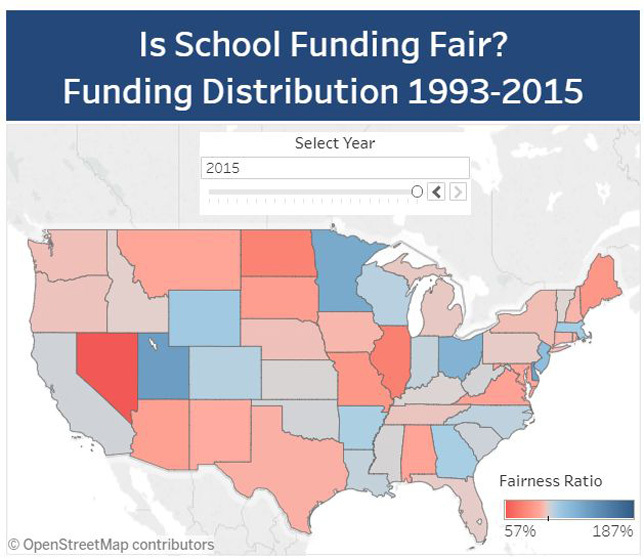 "Is School Funding Fair? A National Report Card" is openly available, along with interactive tools, on the School Funding Fairness website.